← Chicago 2019: We Got Videos, Yes We Do! The Twin Cities Auto Show was not my final stop on the circuit. That was reserved for something that challenged my memory. In December of 1996, I arrived in Washington, DC seeking a complete change of life. I was already involved in an online community of like-minded gay/bisexual men and I also brought that movement to the Nation’s Capitol. It was an interesting time. I learned a lot about life and where I should be in it. It was well before I would undertake a career in writing/blogging/photography/media/etc. I tried to recall whether I attended the Washington Auto Show during my time in DC and Northern Virginia. I don’t think I ever attended any auto show on the East Coast ever – even after I moved from there in October of 2000. 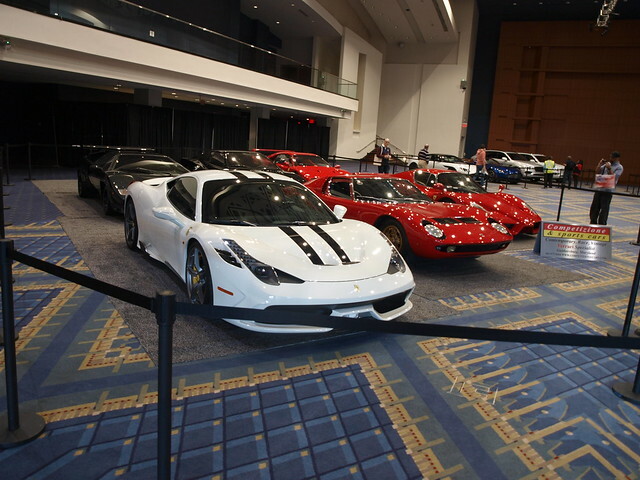 With all things considered, I attended my first Washington Auto Show. It was not exactly the auto show experience that I usually do when I work in Chicago, Minneapolis, or anywhere else. The reason I say this is that the auto show itself served as a backdrop for an event I participated in. 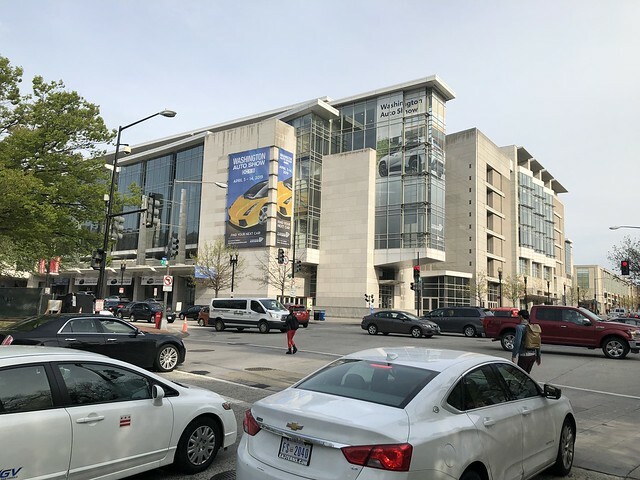 As a first-year member of the Washington Automotive Press Association, I chose to attend their EV Day rather than any of the previous week’s Mobility Talks, media preview, preview gala, and LGBT Family Day. There was no rhyme or reason I chose to do the EV Day other than budget considerations and so forth. However, there was more on the plate than just the day at the Walter E. Washington Convention Center. 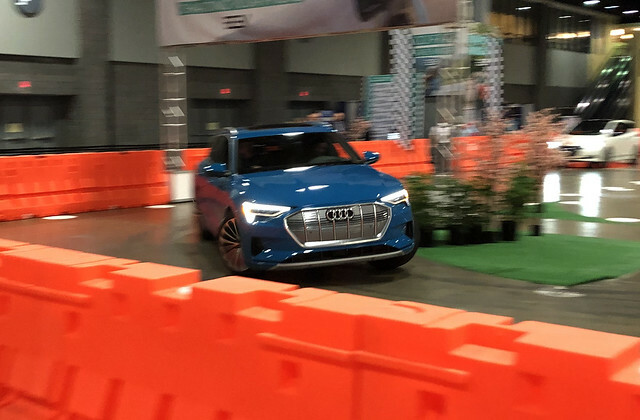 Alongside WAPA’s EV Day was an invitation by Audi of America to test out their latest Vehicle-to-Infrastructure technology using Traffic Light Information and a new feature called Green Light Optimized Speed Advisory. Not only was I to immerse myself with electrified vehicles, but I also was testing new driver assistance technologies. Perhaps all of this was to fill the void from my last time I visited DC some ten years ago. Or, to reconnect with the community after leaving it 19 years ago. But, it also brought another interesting twist to this story – the transition and evolution of a middle aged cis-male homosexual who once ran after Metro trains late at night to get back to my home in Falls Church after a night of Beardom to this semi-hardened automotive journalist running around in an Audi across Northwest Washington and beyond. 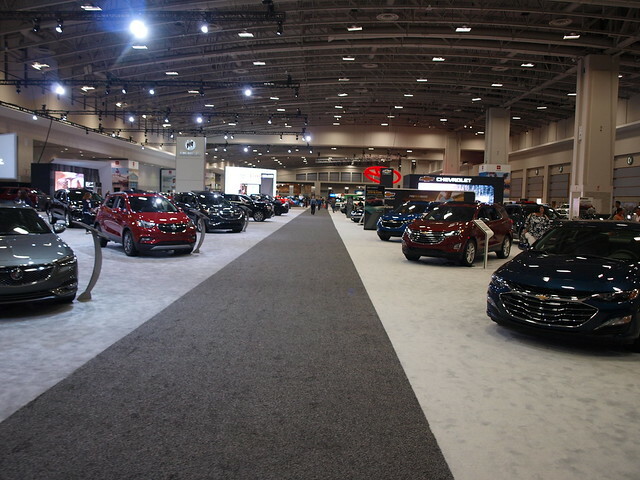 Let’s talk about the Washington Auto Show, shall we? Some of the subject matter was fascinating. Unfortunately, I was not there to witness these discussions, or attend the media preview and a “Family Day” that lead to the public opening of the show. A week later, I arrived. And was very impressed with the show itself. I took the walk around three floors, spanning two city blocks of the “new” Walter E. Washington Convention Center across from Mt. Vernon Square. The customer service among the red-shirted staff was friendly and welcoming. Even the event minders were great to work with on the day of the WAPA event. All of my concerns were thrown out the window. If I had to point to a big bit of news, it was the presence of two 2020 Ford Escapes. They had a roll out of the newest version of Ford’s compact SUV a couple of weeks ago in Dearborn. 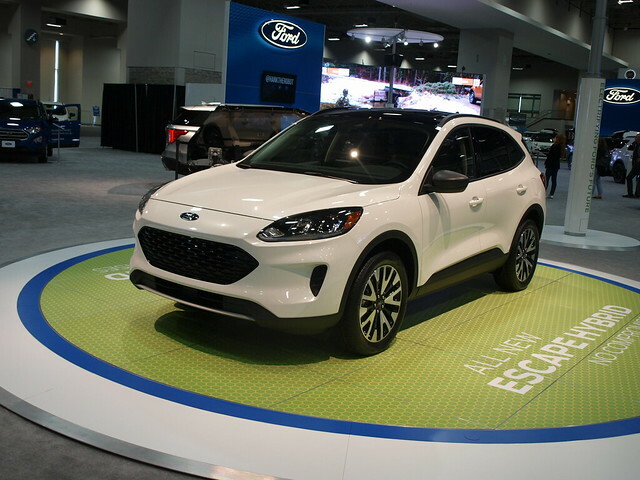 Without any fanfare, these two Escapes – a Hybrid and a Plug-In Hybrid – made their auto show debut. A coup for the Washington Auto Show, indeed! I have to admit to liking the new look of the upcoming generation of Escape. It looked like the Focus we were supposed to get. However, it will serve Ford well. The only hope is that this will help Ford to gain ground on Toyota and Honda in this segment. Audi was in civic pride mode at their display. Their headquarters is across the Potomac in Herndon, Virginia inside of a non-descript office building with only a few discreet signs around it. 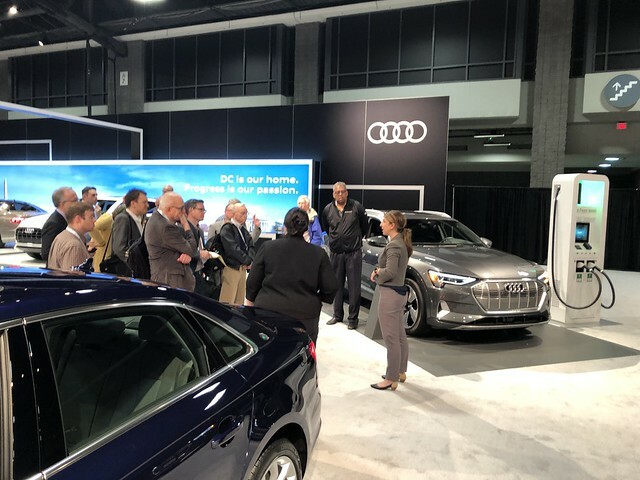 The background of two iconic Washington monuments sent a message to Auto Show goers that Audi is a part of their community and here is what they offered! One of the WAPA event’s photo opportunities was around a white Q8 up on their stage in the back of the stand. Off to the side is the e-tron quattro SUV, alongside an Electrify America charging station. This was to affirm the partnership between Electrify America and Audi to provide 1,000 kilowatt-hours of electricity for no charge when they buy or lease an e-tron. It also helps that Electrify America is also based in Reston, Virginia – not far from Audi’s USA headquarters. In their Hall A, located on the lowest floor of the Convention Center, were four indoor ride-along experiences. For WAPA EV Day, we rode along in three battery-electric vehicles in a very tight course to demonstrate that you do not need a Tesla with Ludicrous Mode to have fun in one. Excelon and their partners lined up an Audi e-tron quattro SUV, a Hyundai Kona EV, and a Nissan Leaf for tire-squealing, tight cornering, and high torque madness. My challenge to them is to do the same at a nearby race venue. I would like to see that. Aside from the EV course, Camp Jeep set up their course across the way. Further down the hall, Land Rover set up a more genteel version of an off-road demonstration course, while Jaguar touted the i-Pace electric vehicle on an equally genteel pace than the EV tire-squealing down the hall. In-between the two larger halls is a smaller room that held court for its custom and exotic automobiles. On one side was a collection of some of the greatest modern Ferraris ever crafted. A fan of the Prancing Horse would stare for hours admiring the millions of dollars of legendary Italian machinery that are in front of their eyes. Equally impressive was the small collection of vehicles from the Rolls-Royce and McLaren dealerships in Sterling, Virginia. Prime amongst all of them was the new Rolls-Royce Cullinan SUV. Most of my concentration that day was centered on the WAPA EV Day event. Yet, being inside the show before the doors open gave me an opportunity to see what this show was all about. To actually walk the halls and get a feel for it. However, it is difficult not to make comparisons with the other auto shows I have worked and attended over my lifespan. Each one lives on its own merits. If you take the show itself, I actually like the Washington Auto Show for the size and significance in engaging with government policy. The latter might come in handy, as my previous professional life as a defense contractor in IT procurement helped shape some of what I do. I will admit that some of it started to come back to me as I walked the floor of the Convention Center. Before you ask, I am considering a return to a future Auto Show. This time, to concentrate on the Mobility Talks, media preview and “family day.” Watch this space to see if that will take place – and when. This wraps up another auto show season. Sorry, folks, but I will not be continuing on into New York for what could be a significant round of debuts happening at the Jacob Javits Center this week. Thank you, WAPA and the Washington Auto Show! We will meet again.